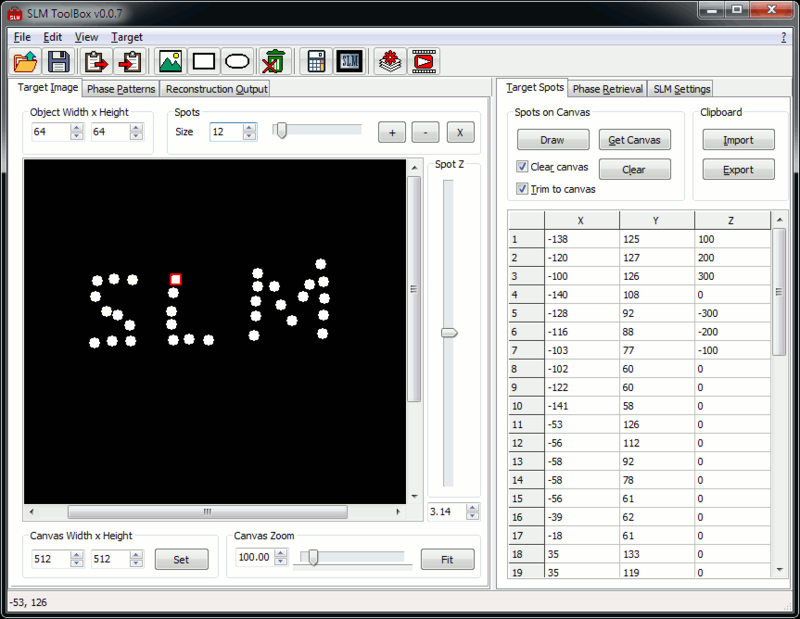 SLM ToolBox is a free graphical user interface software for controlling spatial light modulators (SLM). Versions for 32 bit and 64 bit Windows. Simple phase projection to SLM. Interactive mouse controlled 3D spots for optical tweezers, etc. Real-time random mask spot hologram for 3D spots [ref]. Built-in phase pattern generators: binary, vortex, axicon, cubic phas gratings etc. Built-in hologram calculator using Gerchberg-Saxton algorithm. Import custom phase images or SLM correction. Export generated hologram or phase patterns. Batch calculate multiple CGH files. Image player for hologram animation.